The Revolver Auto Band-It will quickly, securely, and economically unitize your products in seconds. 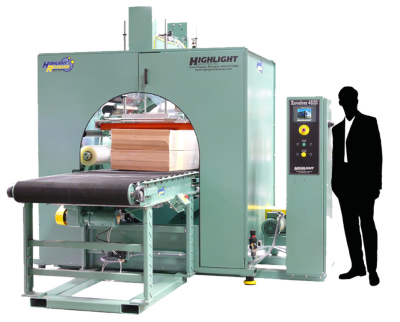 You select the number of wraps per band or continuous wrapping for full film coverage on your product. The Film is heat sealed at the end of the wrapping process for extra security. The film's stretch level is fully adjustable to match your specific load-holding requirements. 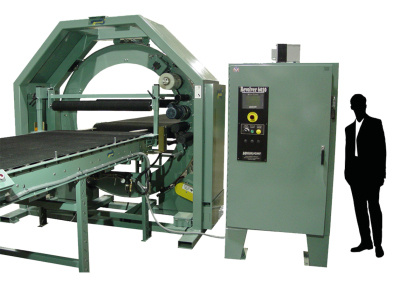 Revolver Systems can wrap products of nearly any length, shape, and configuration, allowing you to unitize and protect your products efficiently. Choose the features and options available on the Revolver Series to match your project needs. Revolver Systems are designed individually for each customer's requirements. 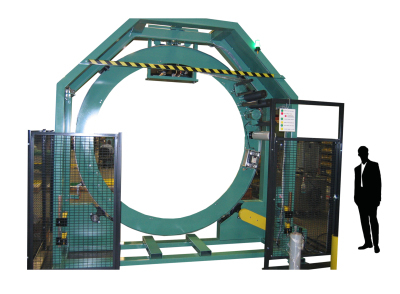 The Revolver Series is built with a variety of selectable components to give you the best production speeds, protection, and product handling available in any orbital stretch wrapping system. CLICK THROUGH THE REVOLVER COMPONENTS BELOW TO LEARN MORE! The Revolver can be built with any of our 9 standard ring sizes, as well as custom sizes, to best wrap any size or shaped product. Systems shown below are examples of the most popular standard ring sizes. Manual, Semi-Automatic, and Automatic control packages are available on the Revolver Systems to suit your requirements for production speeds, operator involvement, and project budget. 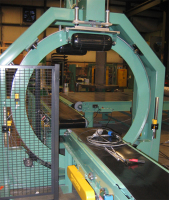 Manual Systems are typically the lowest cost and highest in labor time. 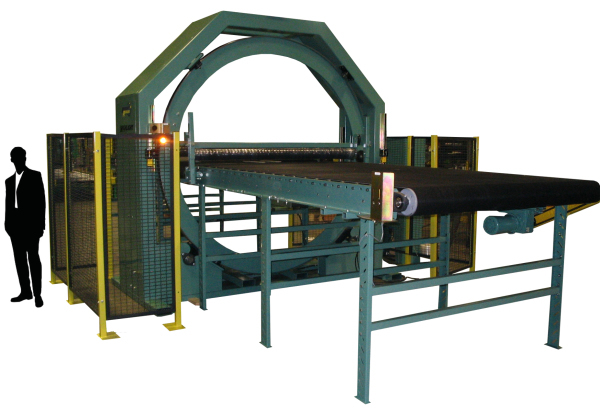 The wrap cycle procedure and film attach/cut are all operated manually. 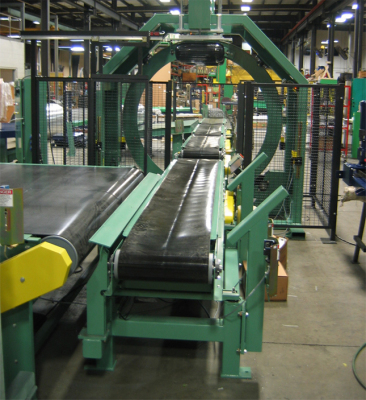 Semi-Automatic systems reduce labor time and allow programs to be set to ensure consistent wrapping. 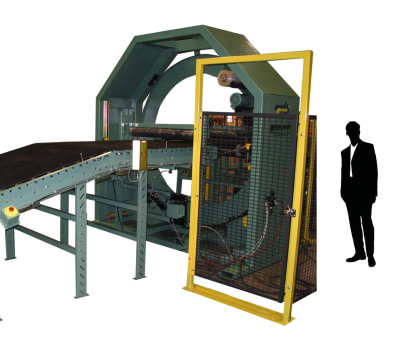 The wrap cycle is operated by control panel functions, the wrap cycle is run automatically and the film is attached and cut by the operator. 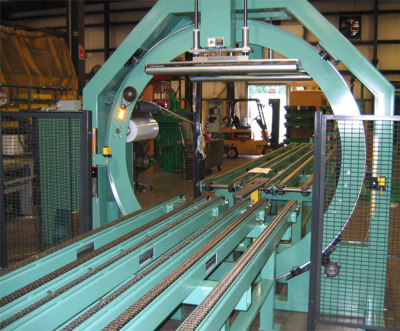 Fully automatic systems drastically reduce labor time and increase throughput while maintaining the most consistent wrapping controls. 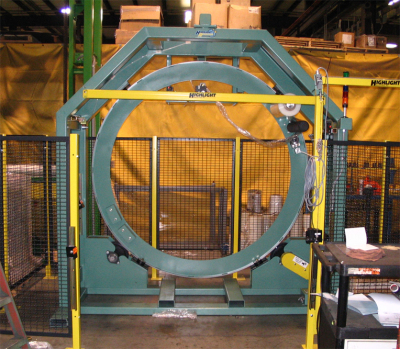 The system operates using sensors that detect the load as it enters the ring to be wrapped. 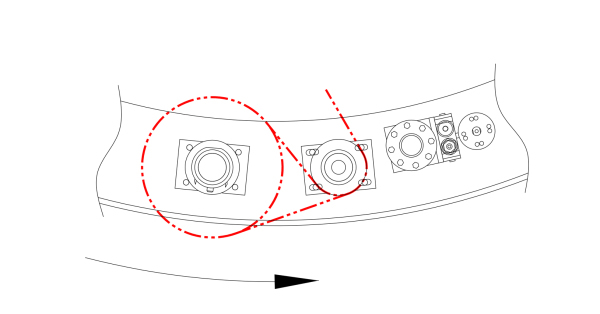 The wrap cycle is started when these sensors are triggered, and the film is attached automatically at the beginning of the cycle, and cut at the end. Hydro-Stretch is a simple force to load system that allows infinitely adjustable wrap tension and precise control. Powered Pre-Stretch delivers excellent film savings and stiffens the film to provide greater containment force. 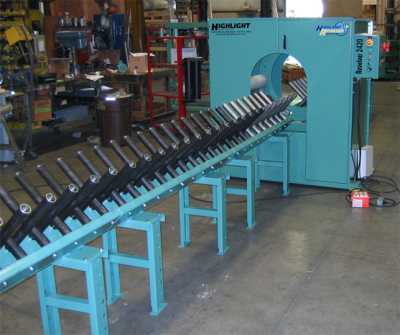 The Revolver Systems can be integrated with a variety of conveyors to increase efficiency and productivity. 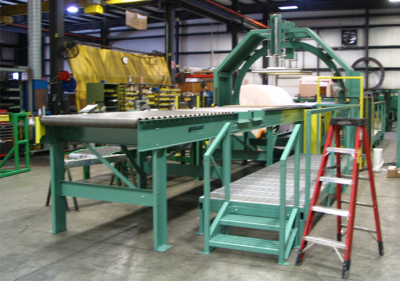 Different conveyor styles are available to accurately and efficiently wrap and contain varying types of products. 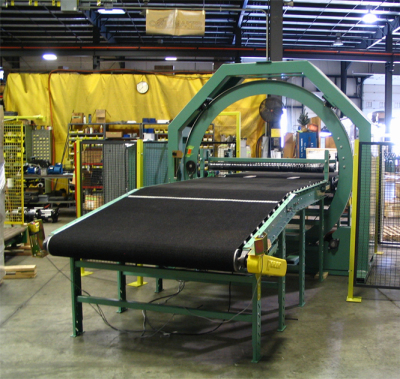 Conveyorless systems are also available for wrapping on a forklift or by hand. accomodate your product, or contact your Highlight sales representative for a custom film size. The Revolver Systems have a variety of options available to aid in wrapping and containing your products. Custom options can also be designed to your meet your specifications. Contact your Highlight sales representative to custom build your Revolver system. 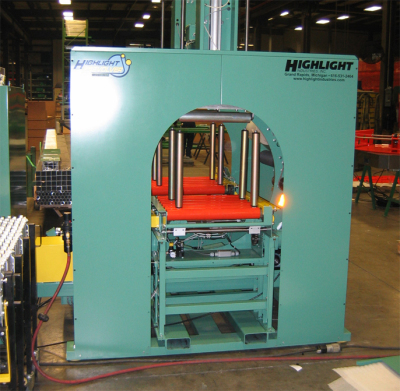 Platens are available to help hold down products as they are wrapped. 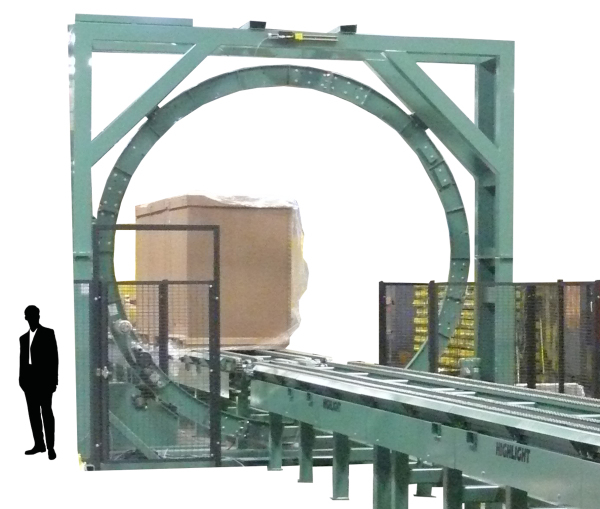 The support bridge fills the gap between conveyors when the product is in the center of the ring being wrapped. Side guides are available to help guide your product through the machine as it’s being wrapped. 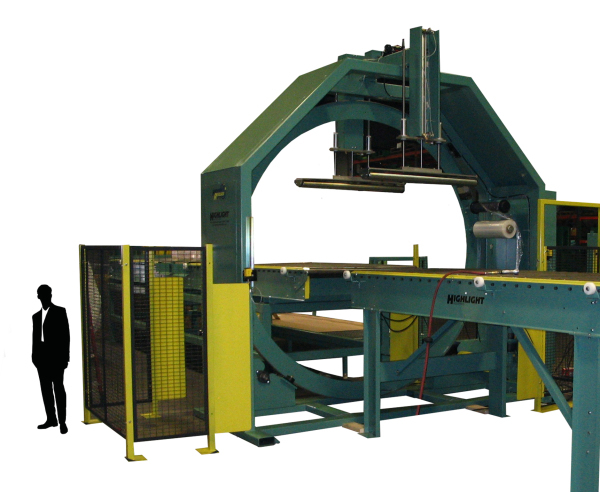 Used for centering and compressing skewed or off center products.